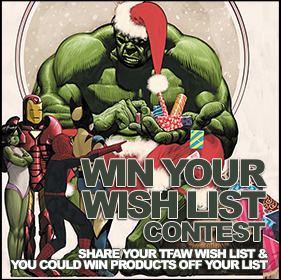 This holiday season, we held our annual Win Your Wish List Contest and tons of people shared their TFAW Wish Lists with their friends and family. We know this helped make the holiday that much more geeky for a lot of you, and we’re excited to announce the winner of this year’s contest! Congratulations to Lauri from Middleboro, MA! We’re sending you a $100 TFAW Gift Certificate so you can pick up some of those items on your list that you didn’t get this holiday season. Thanks to everyone who entered. Now on to the next contest! Who wants to win a subscription to the new Spider-Man comic book series? Click the link below to see how you could win.